My story, starts quite simply; I was raised in a poor neighbourhood in a modest city in the Western part of Canada. My sister and I were raised by our single mother. We didn’t have much. My mother worked a blue collar job on a wage barely above minimum so we had to live with family to make life somewhat affordable. We had a very loving household even though my mother worked very hard, clocking a lot of hours at the warehouse where she loaded and off-loaded trailers. My mother was at work early and there until late. I had to learn responsibility from a very young age. Getting myself up and ready for school, often making my own lunches and walking with my sister to school for the day. By the time I was 10 years old, I already knew how to cook and do my laundry. I wouldn’t trade that life for any other I could have had. We didn’t get many luxuries but we never needed for much. I was able to play all the sports I wanted (hockey, baseball, lacrosse) because of the dedication my mother put into her work. It was hard but worth it. Sound familiar? So that’s what I did. I went to University and earned a Bachelor of Commerce degree. I got a good corporate white collar job and was miserable. So I decided to upgrade my education and completed a Masters of Business Administration (MBA) while I was working full time. The strong work ethic I learned from my mother enabled me to complete a 2 year program in just over 1 year. My intention was to upgrade my work position. So, the day after I completed my graduate degree, I fired my boss. I had decided that I would be an entrepreneur from that moment on. Since that fateful day in 2009, I have consulted 20+ companies on hundreds of marketing projects. I have owned and successfully built 6 companies of my own. I am on the hunt to find and acquire great businesses and grow them. I love to work at taking a business to a level where it has a significant impact on the life of its employees, their families, its customers AND its owner. One great business has the power to change the lives of millions. Results. Results. Results. is one of my core values. I prefer to demonstrate the results I have achieved with my team as well as share the story. How do you take an idea and commitment to start an online bank and morph into a mobile remittance service? 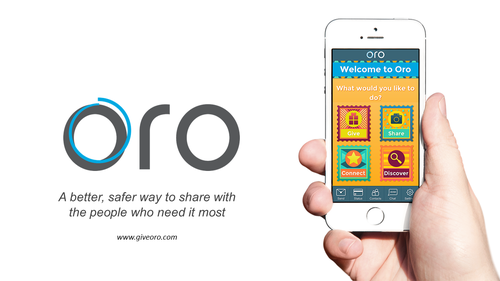 Take a dash of creativity, a pinch of innovation and add some cryptocurrency and you get Oro. A heartwarming and provocative discussion about how a company can have its cake and eat it too. The big question is how do you market a business that already has more business than it can handle? The results may surprise you.